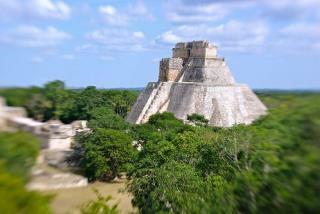 (Newser) – The bad news is that Mayan ruins make not one but two apparent references to a possible apocalypse in 2012. The good news—maybe—is that Mexican archeologists say not to worry about it. Experts have finally confirmed that a second suspected reference to 2012 was found at the Comalcalco ruin in an inscription that has been safeguarded in storage for years by Mexico. An earlier find from the nearby Tortuguero site in the Gulf coast state of Tabasco named the same apparent date on a stone tablet. The Tortuguero inscription describes some kind of world-ending or world-changing event that is supposed to occur in December 2012 involving Bolon Yokte, a Mayan god linked to both war and creation. What is all the whohot about? Who will really care how it ends(if it ends). Religiously the bible says we will not know in advance when it is to end.......I don't "Bible thump" , but I also don't worry about things I don't know for facts! But the article had several funny opinions.